Product # 1 – Are you still looking for a swivel TV stand to hold your 1982 14 inch television and your VCR? Well after more than 2 decades the search is over thanks to Harriet Carter! The best part is that this is still being sold from the Harriet Carter crapalog. Who’s buying this? I also love how there are extremely helpful arrows that allow us, the buyer, to understand exactly how this TV stand works. Oh I get it, it goes left and right. I would have had no clue. God bless the arrows! As a side note, who’s watching TV that close to the floor? I mean, I could understand that it’s more than convenient for the elderly who are probably buying this since they do spend countless hours passed out on the floor. I guess it just makes sense to watch a little TV while you’re trapped on the floor for hours waiting for someone to help you out or eventually smell the odor coming from your rotting corpse. Let’s hope the mailman, who will end up scraping you up off the floor, still likes watching The Honeymooners. 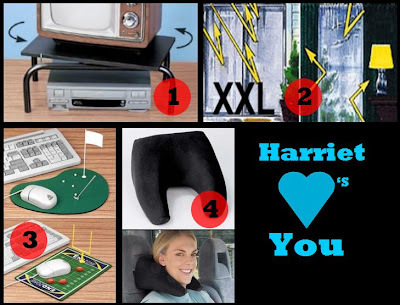 Thanks Harriet for bringing the 80’s back. Product # 2 – It’s time to play, “Guess The Product!” Harriet is at it again with her tricky “arrow” skills so I assume she’s simply selling arrows. However I was wrong. But, if you guessed that this product is a bug zapper….you too would be wrong. This product is actually a plastic solar curtain. No really, it is. Supposedly this plastic solar curtain will keep you warm in the winter and cool in the summer. Somehow, that’s what the yellow arrows are supposed to represent. Either that or it’s letting you know that lightning bolts can easily enter through the curtain at either side. The description actually says that with this plastic curtain you can easily see out, but others can not see in. Really? Because with this lifelike cartoon drawing of the curtain I can’t really see anything. Why the cartoon drawing? And why the “XXL?” And where the hell are some of those arrows pointing to? Why are they pointing an arrow at the lamp? Does the lamp come with it? If they throw in the lamp I may consider buying the plastic solar curtain. Oh, and are those the actual same sliding doors that were in The Brady Bunch? Wait, was cousin Oliver behind this? Thanks Harriet for helping to decorate my house in plastic. Yes plastic. I’ll save some cash and just use my shower curtain. Thanks though. Whore. Product # 3 – Do you ever wonder why 99% of the other countries think that Americans are the laziest people on earth? Well wonder no longer thanks to this extremely useful and “work-productive” product. Are you ever typing away at work and clicking the mouse and thinking, “Damn I could go for a mini game of golf right now!” I know! Me too! I’m a little different though because as I’m formatting up some spreadsheets I always feel the need to stop and kick a mini field goal or two. Seriously, what are they thinking? Are you supposed to keep your mouse pad set up with all this crap and just try to “click” around the golf club, golf balls, and flag? Really? You know what I think? I think just do your job. That’s all. You’re not 12 yrs old. You should be able to focus on your job and then kick field goals after work. Do you wonder why you’re stuck in a dead end job with no career growth? Yeah, look down at your mouse pad. Product # 4 – I heart “Failure Model Chick.” She means well. We’re all struggling at something so I always feel bad for “failure model chick.” What does her portfolio look like? Do you think she was psyched or pissed when she had to model the neck car cushion? I wonder if she was all, “Sweet! I don’t have to model leopard-print moo-moo’s anymore!” She actually looks kinda happy to be photographed in the car. She’s probably smiling because there is the possibility that her car could crash during the photo shoot and she could be done with all of it. I’m jealous too. Why does “failure model chick” get to be in the Harriet Carter Crapalog and I don’t? I could model the neck car cushion almost as good as she does. Life just isn’t fair. Oh, and why does one need this product? What ever happened to the good old days of just sitting in the car. Yup, that’s it. Just sit there. Why are you such a princess that you need neck support? It’s a car ride, not a space mission to the moon. I mean, I know it’s a real struggle to sit upright while in the car, but at least you don’t have to sit there like a wild animal with your neck flailing all over the place thanks to this handy neck pillow. Thanks Harriet Carter for making my car trip to the corner store much more enjoyable!